The National Highway Traffic Safety Administration (NHTSA) estimates that in 2009 there were more than 5.5 million reported car collisions throughout the United States. Statistics from the South Carolina Department of Public Safety would affirm that 1.9 percent of nationwide collisions in 2009 occurred in South Carolina. The majority of collisions in South Carolina led only to property damage however more than 31,000 led to injuries and hundreds more were fatal. Oftentimes the types of injuries that occur during an accident are related to the type of accident that occurred. There are several different types of car accidents a person may be involved, some involving multiple vehicles and others involving only the vehicle and a stand-alone object such as a telephone pole. One thing is certain though, no two accidents are exactly alike. If you or a loved one has been injured in a car accident due to another individuals negligence, the victim may be entitled to compensation for property damage, medical bills, lost wages, and more. For a free evaluation of your accident claim, fill out the FREE CASE REVIEW form to your right your information will remain strictly confidential. Many factors can go into the type of car accident a person may have such as the type of vehicle driven and the contributing factor that caused the collision. A person who is distracted is more likely to rear-end the car in front of them, and one who runs a red light could cause a t-bone collision. 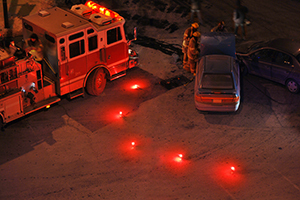 The following are some of the more common types of car accidents. Considered the most common type of accident, this occurs when the front end of one car hits the back-end of another. This type of crash could occur if a driver was tailgating or distracted, and if they were speeding it could lead to serious injuries. This type of collision is just as it sounds, one car swipes another driving alongside of it, this can sometimes occur due to improper lane change or the driver being distracted and veering out of their own lane. According to the South Carolina Department of Public Safety (DPS) more than 5,000 car accidents were caused during a lane change. Most frequently this type of collision happens on roads where there is no barrier to stop one car from hitting another. Additionally, it may occur when a vehicle had turned down a one-way street and runs into an oncoming car, truck, or motorcycle. According to the NHTSA, more than 280,000 rollover accidents occur each year; the South Carolina DPS notes that in 2009 there were 2,532 accidents in which one vehicle rolled over. These types of accidents can happen for many reasons and are often fatal as a vehicle can overturn more than once and often the lands on its roof. In South Carolina overturning accidents led to the majority of fatalities in 2009. Side-impact collisions mostly occur on intersections as it often involves a driver who negligently failed to obey traffic signs and signals. This type of crash happens when the front-end of a vehicle impacts with the side of another, typically ending in a T position. The crash often leads to serious injuries as it can impact a driver or passengers in the impacted car. Multi-vehicle accidents are another type of crash motorists may find themselves getting into and are often referred to as pile-ups. When cars are involved with trucks the type of collision that can occur includes jackknife accidents and truck underride. If you or a loved one has been involved in a car collision caused by a careless driver and the victim is seeking legal counsel, our attorneys are here to help. At Harbin & Burnett we are dedicated to helping personal injury victims fight for the compensation they deserve. We are an experienced and aggressive law firm who will stand by you in your time of need. Our attorneys are knowledgeable in car accident claims and can help guide you through the entire litigation process to ensure that you receive the MAXIMUM amount of compensation you deserve under South Carolina law. You can also contact us online by filling out the FREE CASE REVIEW form at the top right hand corner of this page.